For the Labor Day weekend we decided to go up to Idaho again. 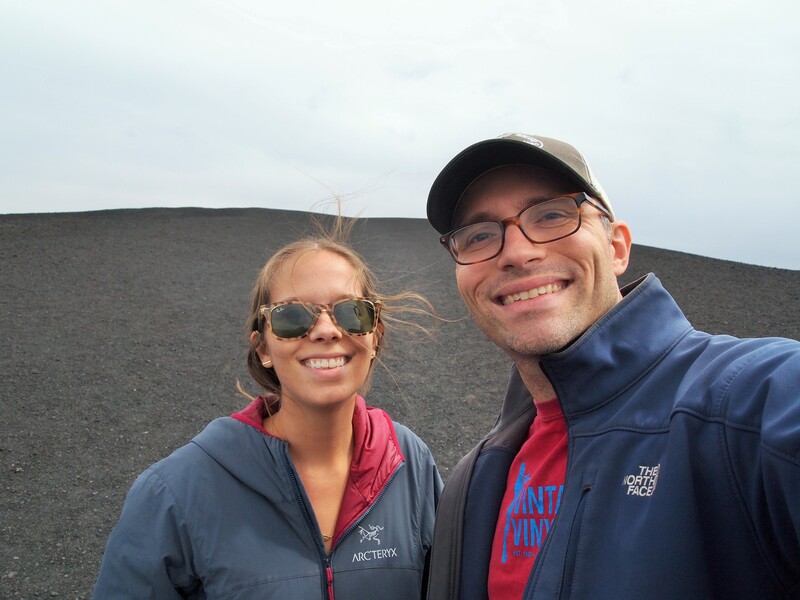 I wanted to go to Craters of the Moon, and Zach wanted to hike Mt. 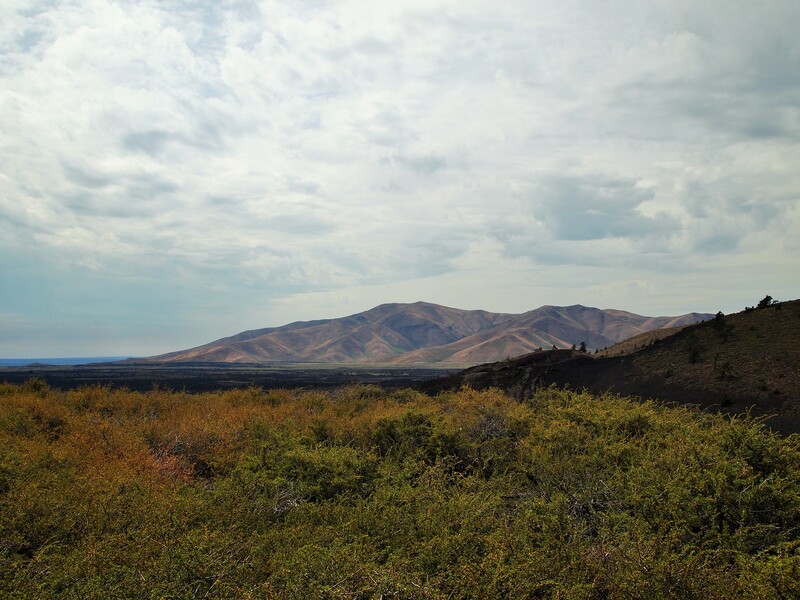 Borah, Idaho’s tallest peak, so we built a weekend around those and left Truman at home. 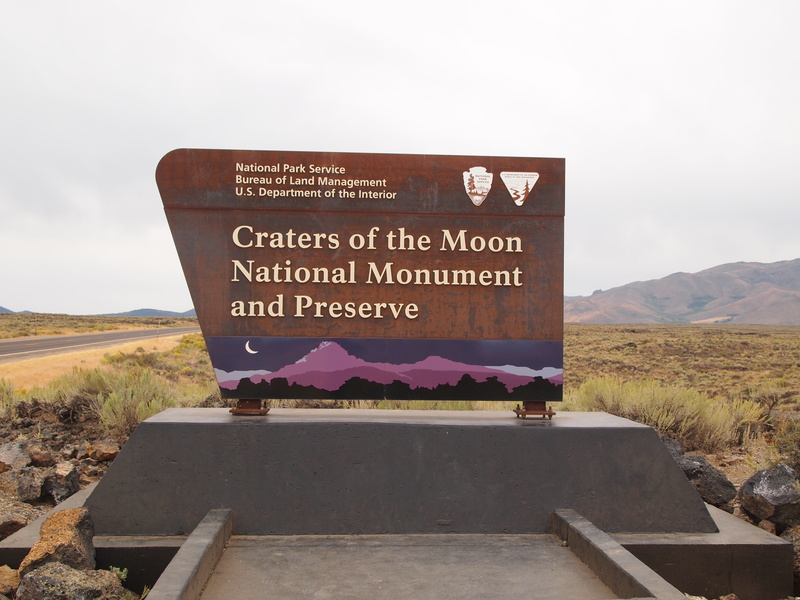 We set off on Saturday morning for Craters of the Moon, a five hour drive from SLC. The forecast warned of rain, but thankfully, other than some small drops here and there, we were spared during the day. Before we arrived at the official entrance to the monument, we stopped at an overlook off the highway. The overlook proved to be one of the best views in the park. 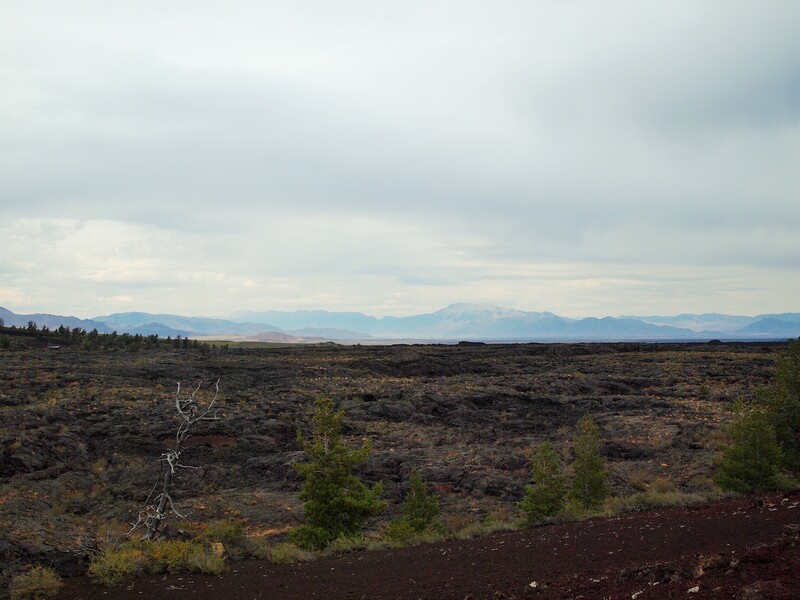 From the highway the Lost River mountains shone in the distance, casting a watchful eye over the basalt plain in front of us. 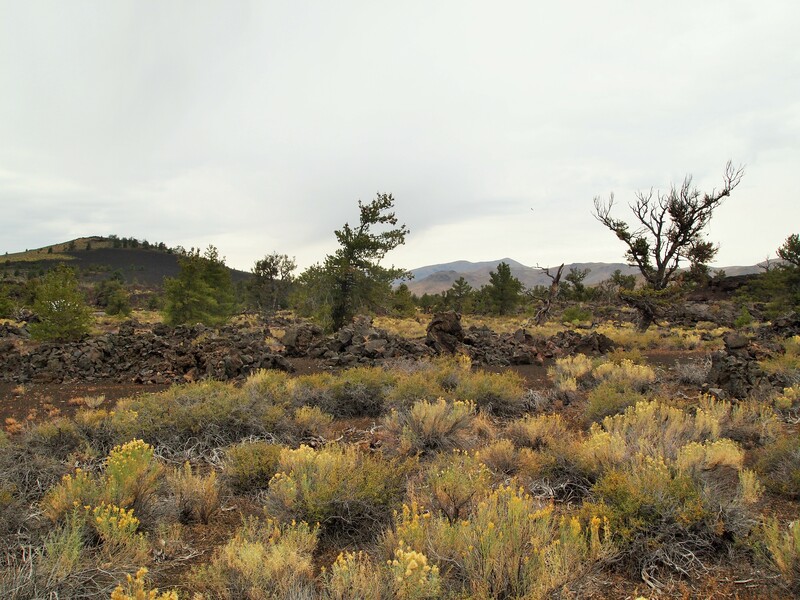 We could see several cones in the distance with varying stages of plant regrowth. 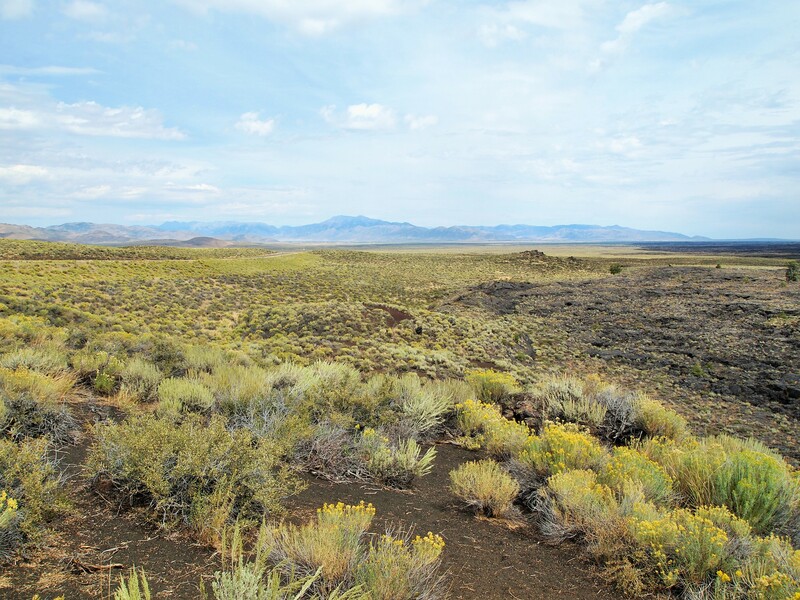 Though I had seen photos of the black, barren fields, sagebrush provided vibrant green and yellow bursts of color all around. There was a small path which led from the main viewpoint to another, better vantage point. 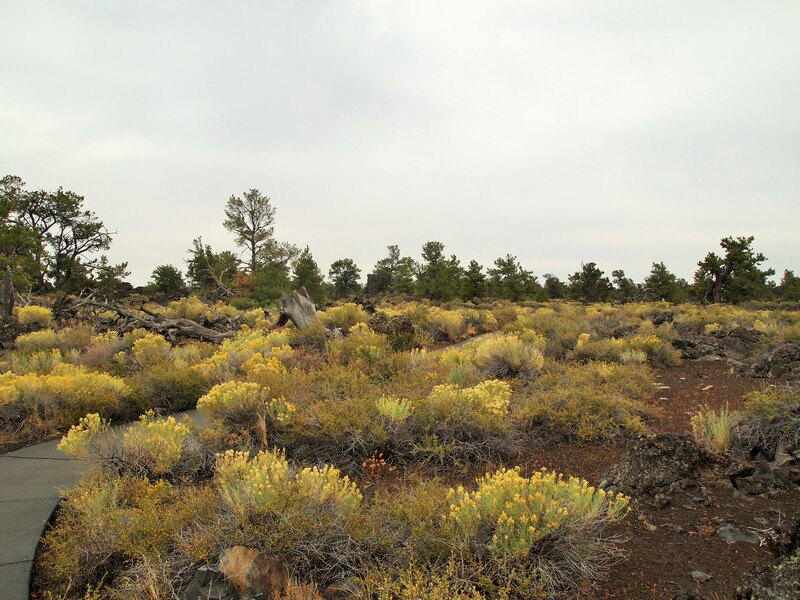 From there the lava flows below glistened in the peeking sun and contrasted beautifully with the flowering sage. 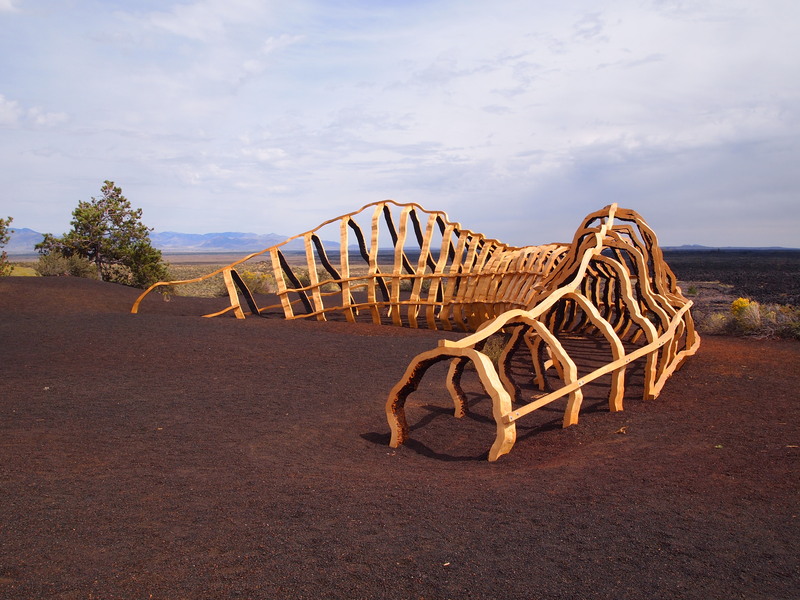 There was also a sculpture of a lava tube from nearby Sun Valley for visitors to ponder. Less than a mile up the road was the main entrance. We stopped briefly in the visitor’s center before beginning our drive on the scenic seven mile loop that grants access to the park’s highlights. 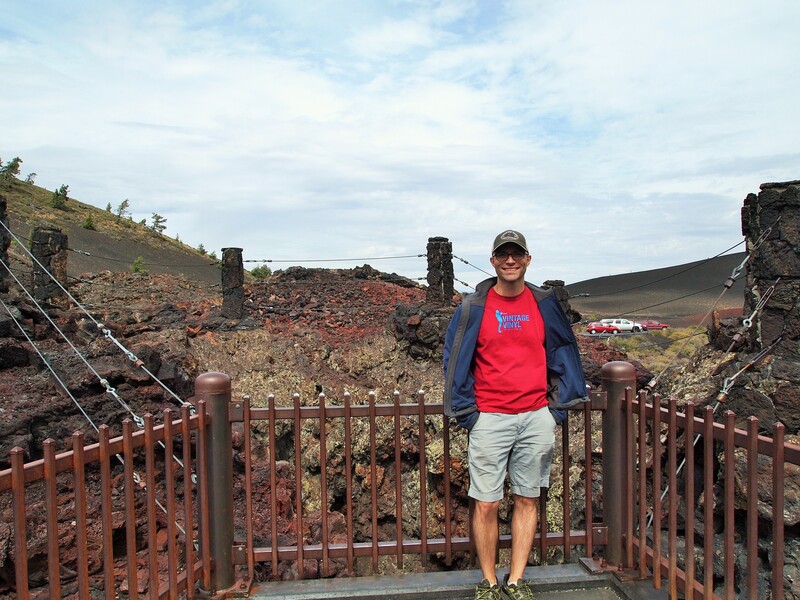 The first stop was the North Crater Flow Trail. 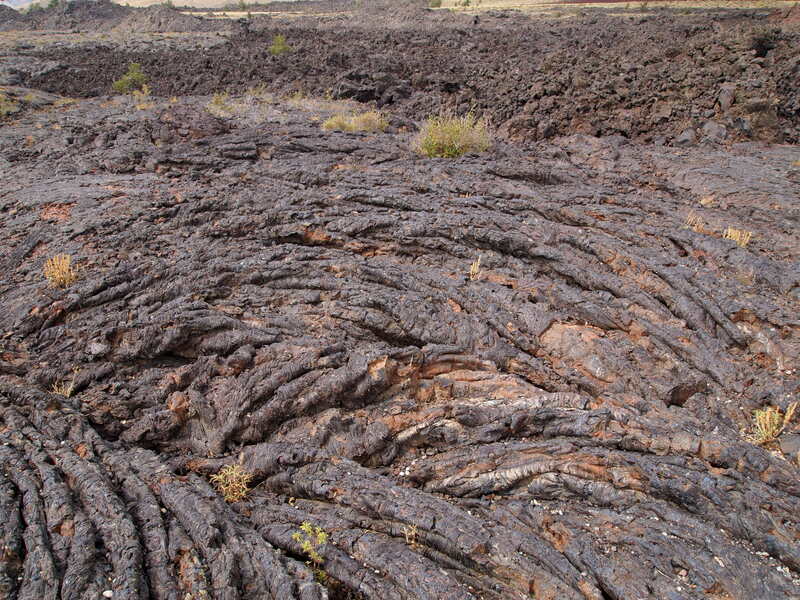 We walked the blackened path into the lava flows, admiring the different types of lava – A’a (ah ah) and Pahoehoe. 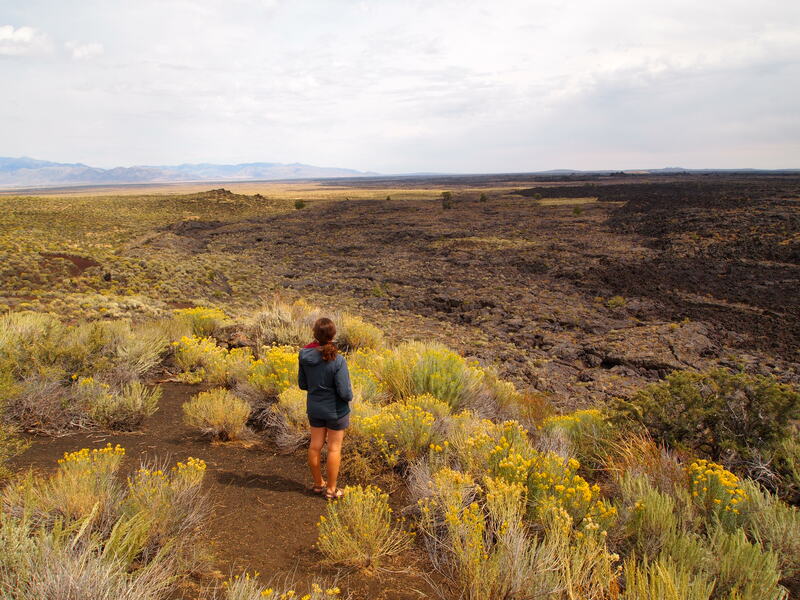 Since neither of us have visited the lava fields of Hawaii, Idaho was our first introduction to such things. 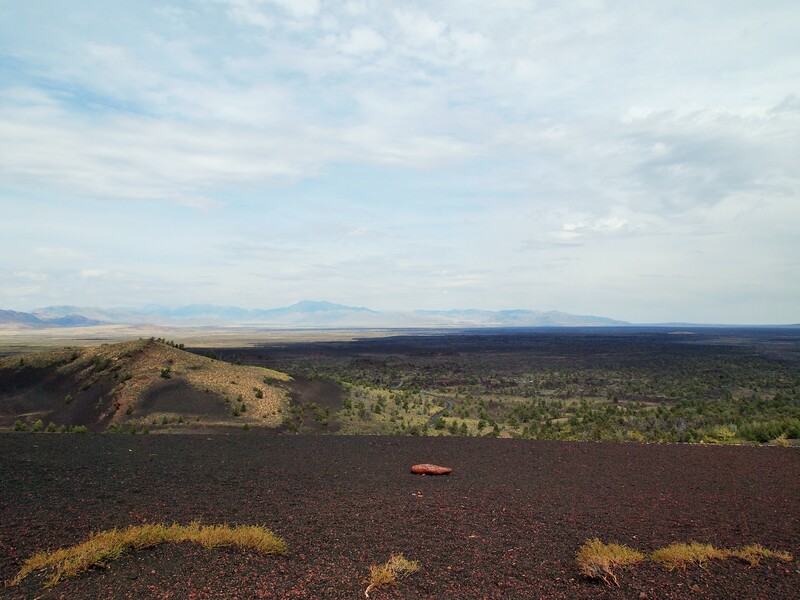 The North Crater loomed large to the west of the trail, and to the north, just beyond the park, at the base of the Pioneer Mountains, the Great Rift begins. 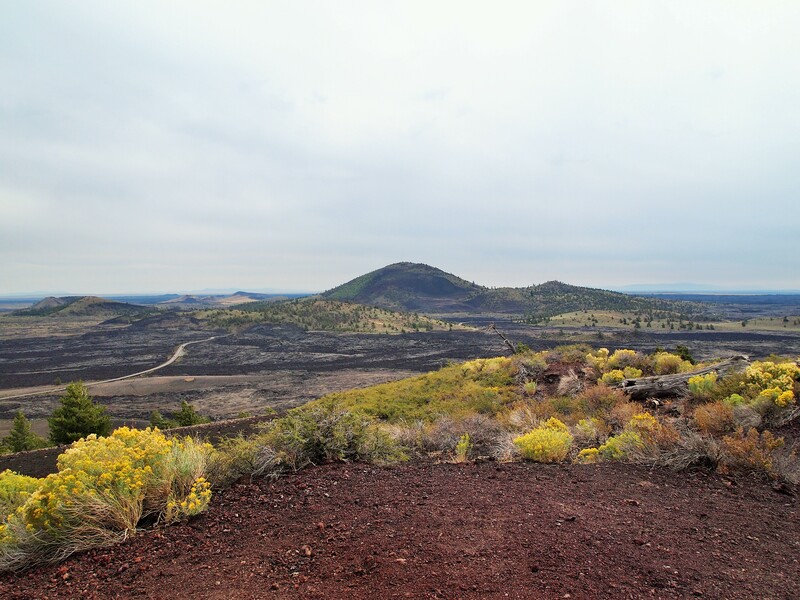 Our next stop, as we passed by cinder fields of buckwheat, was Inferno Cone. 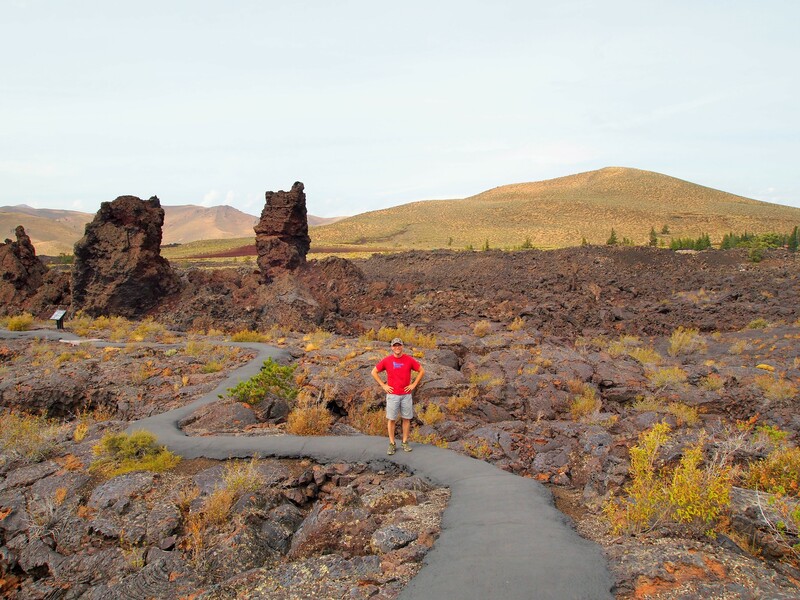 Inferno Cone offered a brief but steep hike to gorgeous 360 degree views of the park. 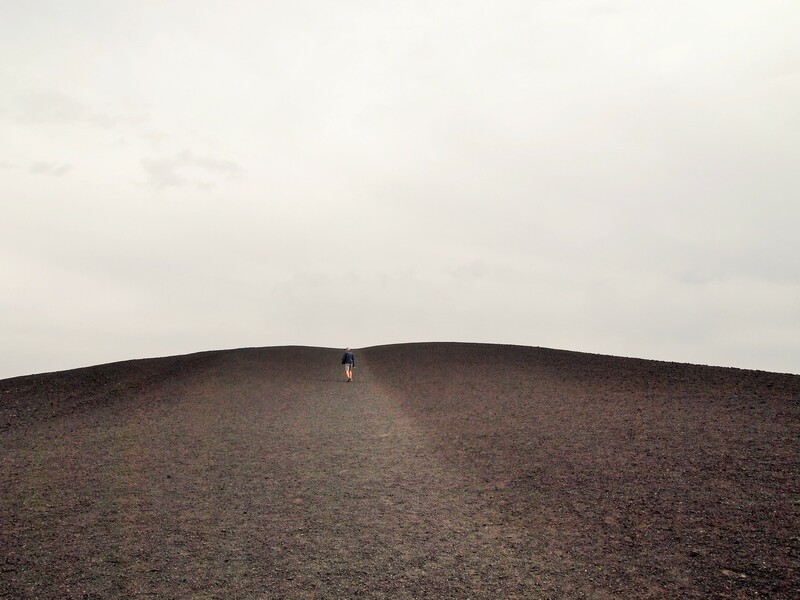 The climb was a little eerie – walking on piles of cinder and having little view of anything that lay ahead. 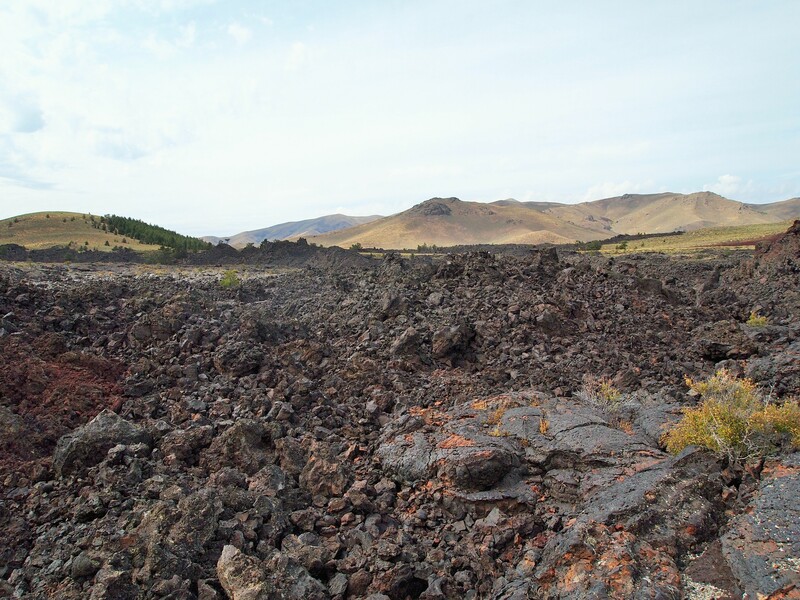 But at the top we were overwhelmed with outstanding views of the Snake River Plain, Lost River Range, Great Rift, and lava flows. Going up Inferno Cone – 6181 ft.
Just next to Inferno Cone were the spatter cones. 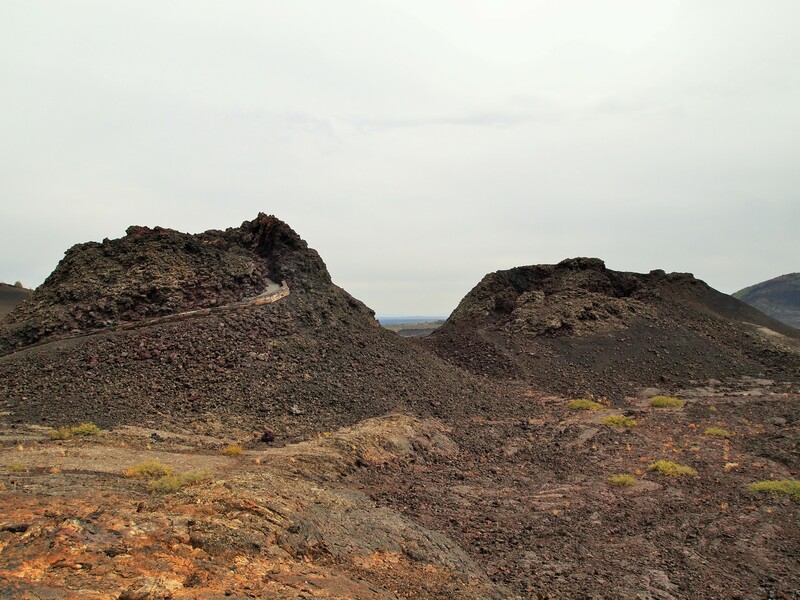 We could walk up a steep path to the top of one spatter cone – which allowed us to gaze into the opening and down into the darkness over the safety of a chain-link fence. The other cone, Snow Cone, was shorter. It was aptly named as it still had snow glistening at the bottom of its shallow depths. 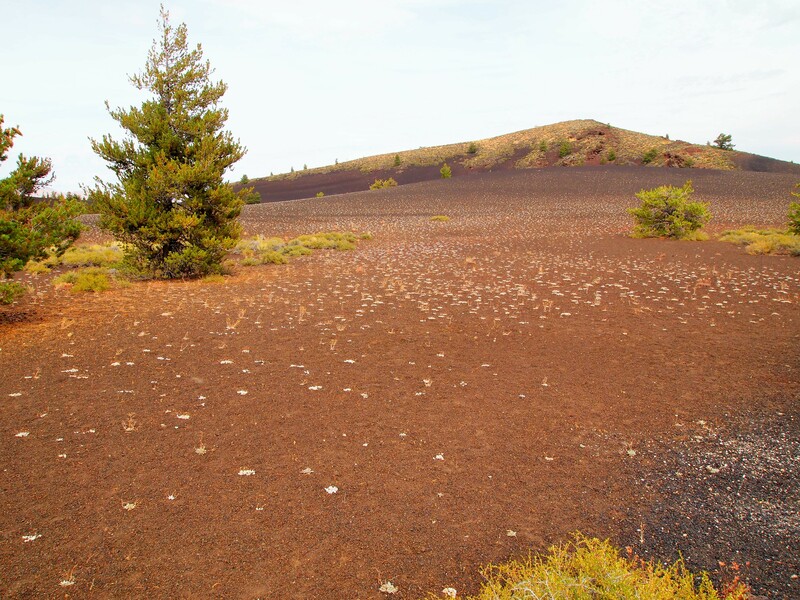 All of the spatter cones have deteriorated from regular environmental forces but also visitors. 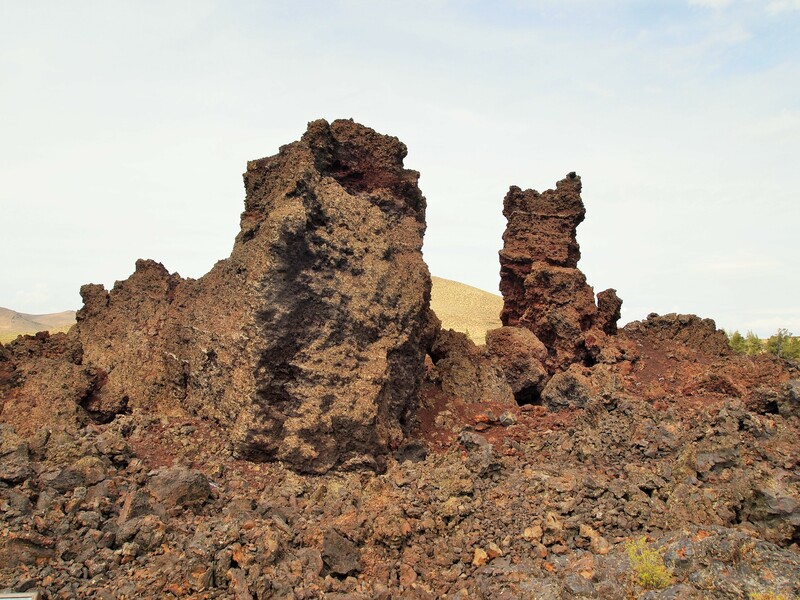 In the early part of the 20th century, these spatter cones were hailed as excellent models of spatter cone structure. 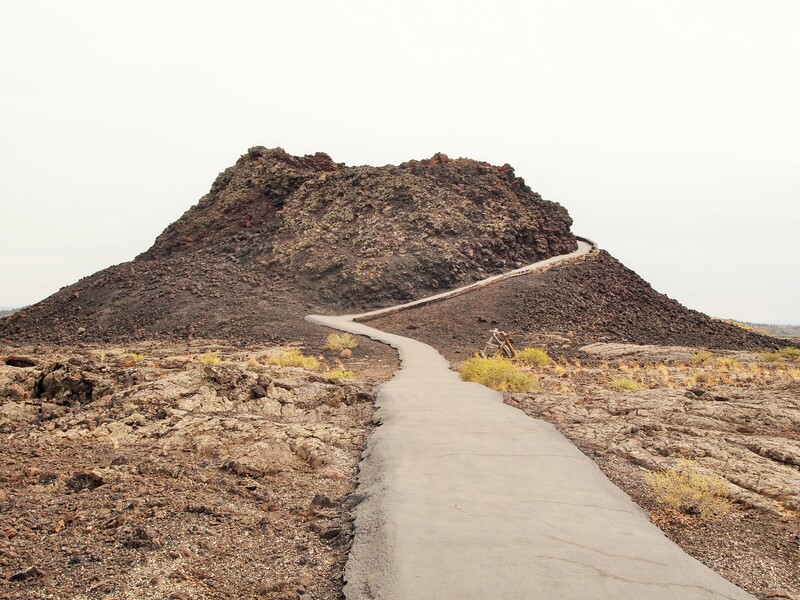 Before proper measures were taken to ensure less environmental impact, visitors could walk and climb all over the spatter cones which led to more rapid deterioration. 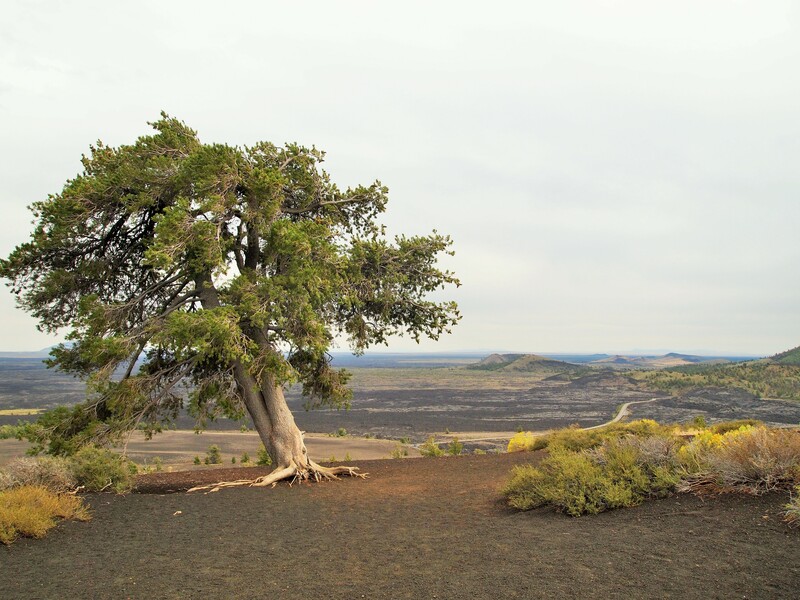 It’s important that we, as visitors, help in the preservation of these special places by obeying park rules. Sadly, we witnessed poor behavior during our visit so not all of us feel this way. 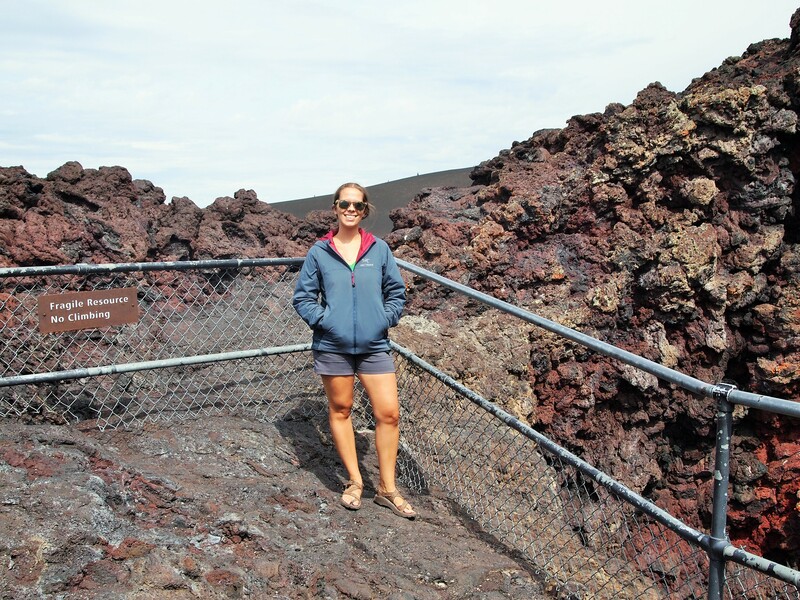 At the top – don’t fall in! 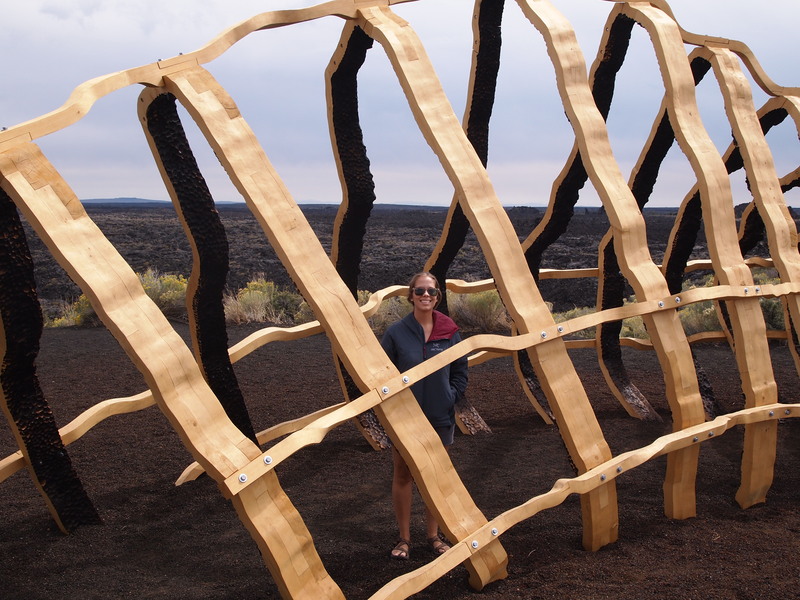 The next turnoff promised tree molds which are the impressions left by charred trees. 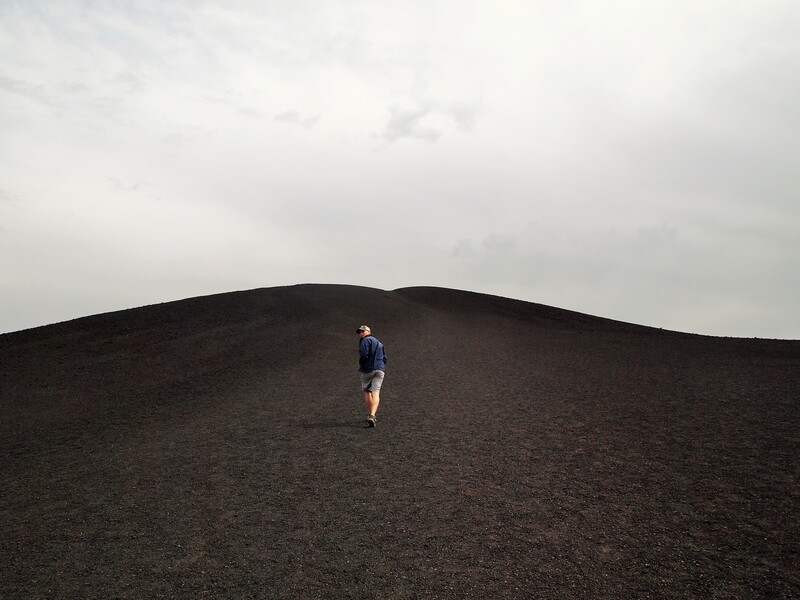 But as we arrived, we realized they were only reachable by a longer 2 mile hike. Time not permitting, we didn’t get to see any of the tree molds. So our next and final stop was Devil’s Orchard. A visiting pastor once described the area as a garden fit for the devil; I suppose that’s where the name arose. I don’t necessarily agree with the name and its inference, as the “orchard” is as filled with flora and fauna as the rest of the monument. 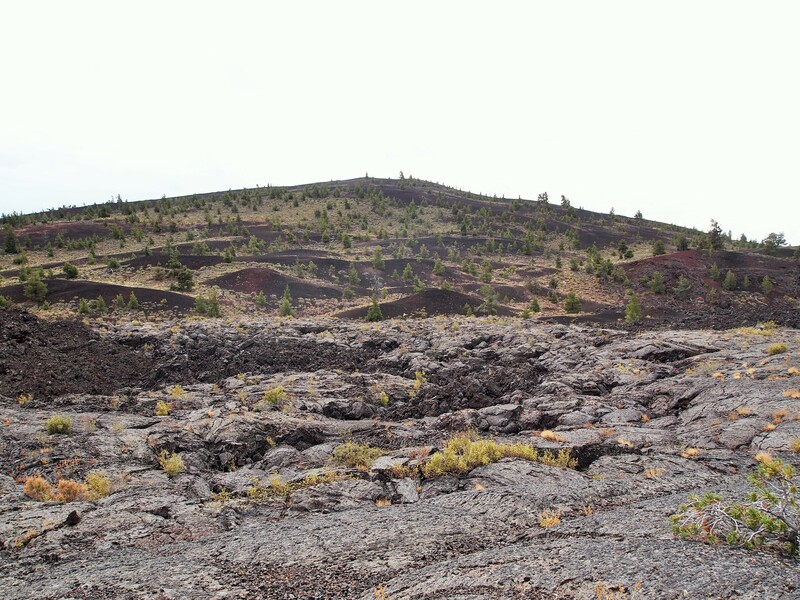 We saw several pikas, heard the melody of chirping birds, and bore witness to plenty of life teeming among the lava rocks. We omitted the caves from our tour as they required more time and permits. However, I am also not a fan of caves so I was more than willing to skip that part of the park. I’m sure they’re awesome! 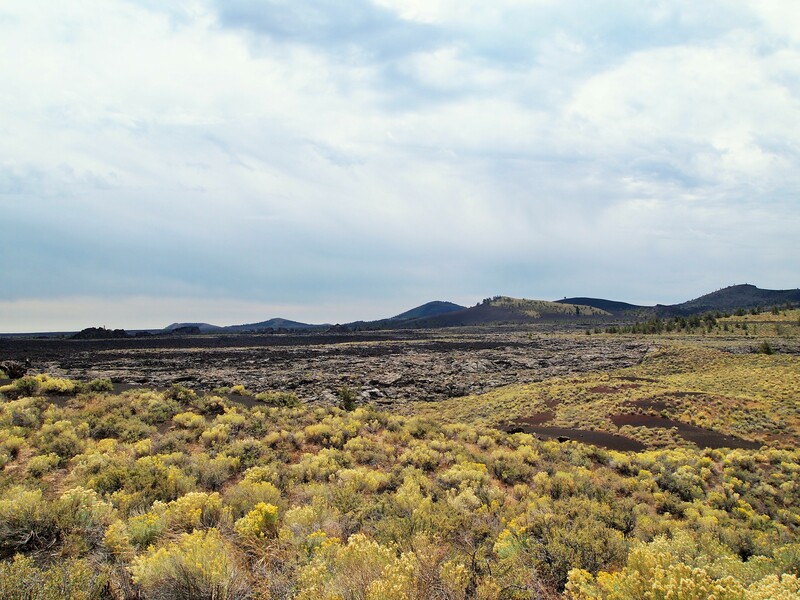 The landscape of Craters of the Moon is varied and stunning. 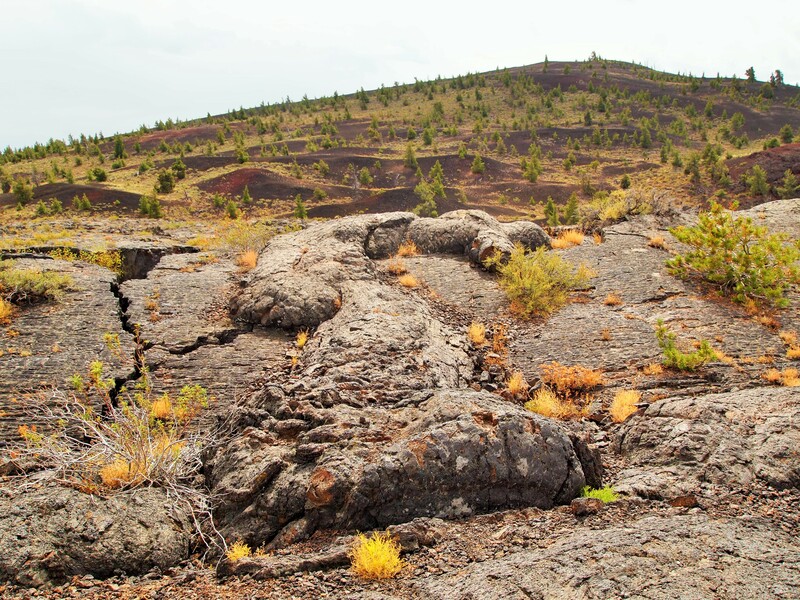 Another eruption is already overdue and will further change the park’s landscape. I could attempt to describe the geologic forces at work, but I think you should just visit for yourself. My only disappointment is that you weren’t actually on the moon. Cool fact though! 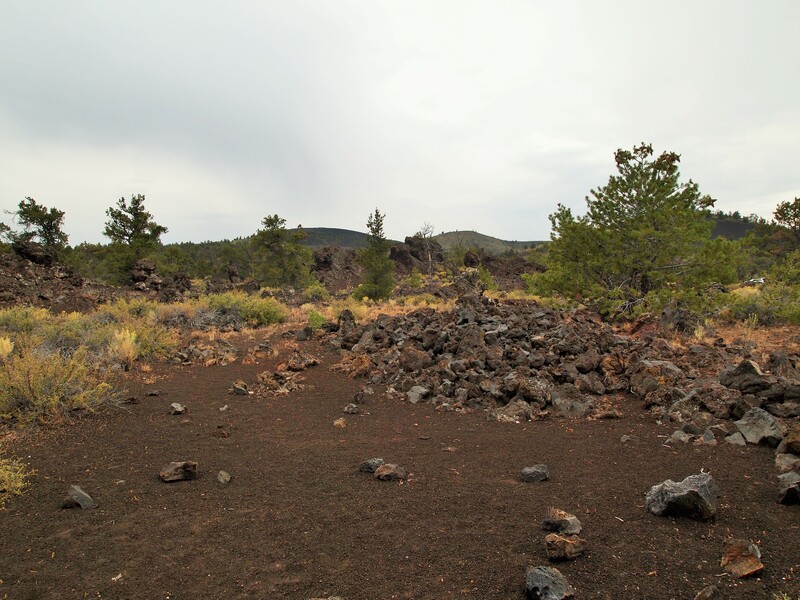 NASA sent 4 astronauts to the park in 1969 to study the volcanic geology so that they would be prepared for moon landings.